And now it’s nowhere to be seen. I can report that the monument has been found. Well, kind of found. Let me explain. 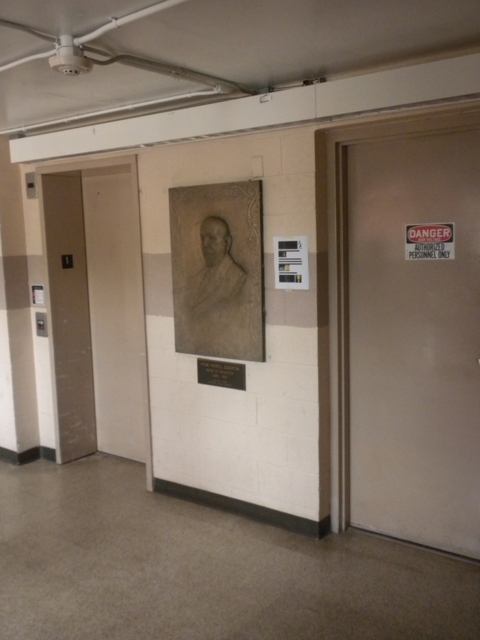 The relief portrait of Mayor Edgerton, sculpted by NYC artist Joseph Renier (1887-1966) has been removed from its larger stone setting, and hangs inside the Edgerton Park Rec Center, on a segment of wall between the elevator and what appears to be a door to an electrical closet or maintenance room. The larger monument apparently is no more. Mystery solved. But I did not think I could call this case closed without a bit more sleuthing, which I finally concluded this morning. My results follow. I found an article in the Democrat and Chronicle, our local newspaper (well, kind of a newspaper today, but once heftier and meatier) from Saturday, September 1, 1923. 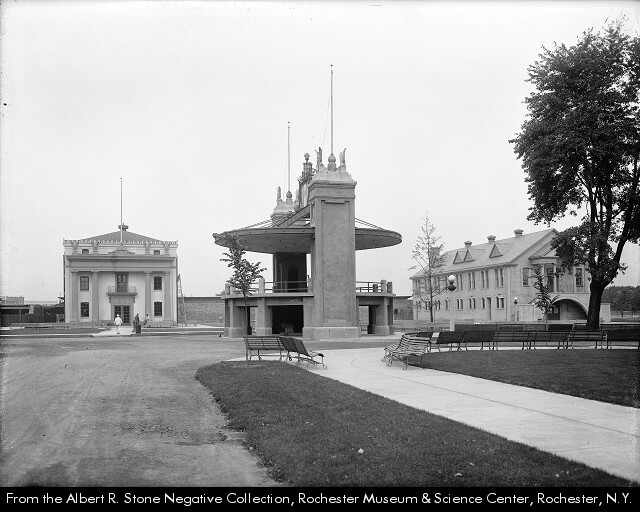 In that article, I learned that the monument, paid for entirely by private donations, was designed by notable Rochester architects Edwin Gordon and William Kaelber. 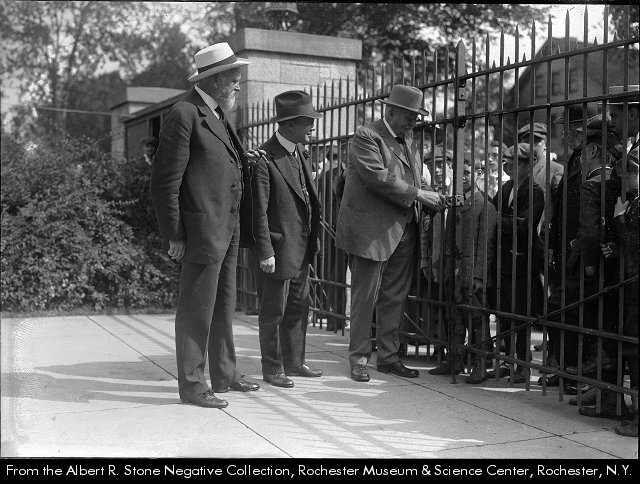 The monument had inscriptions both front and back, words that were written by a committee led by Edward Foreman, who was, among other things, Rochester City Historian from 1921 to 1936. 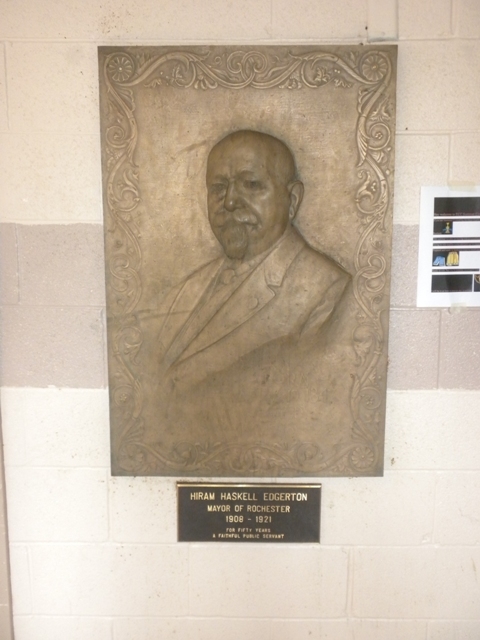 “For Fifty Years a Faithful Public Servant.” These words have been preserved in the Rec Center today, as you can see. But the words that are missing are, I think, an amazing and now vanished testimony to the city of the early 20th century, to the attitudes of that time, and of course to the man who was Hiram Edgerton. There’s still time, Mr. Mayor. Now the case is, indeed, closed. True, I think. Like maps, our lives unfold until all is revealed. And so it is with cities, as we unfold the stories of their places time after time. I have been unfolding the stories of a particular portion of our city for quite a while. It has taken me months to put the pieces together to create an unfolded map of just this one particular spot. The stories crisscross back and forth over a very long time in our city – 165 years to be exact. Get comfortable – this one is going to take a while. This particular place in our city has had many names in many eras: Western House of Refuge, State Industrial School, Exposition Park, and finally Edgerton Park (named in memory of former mayor Hiram Haskell Edgerton, who has appeared in our pages previously). 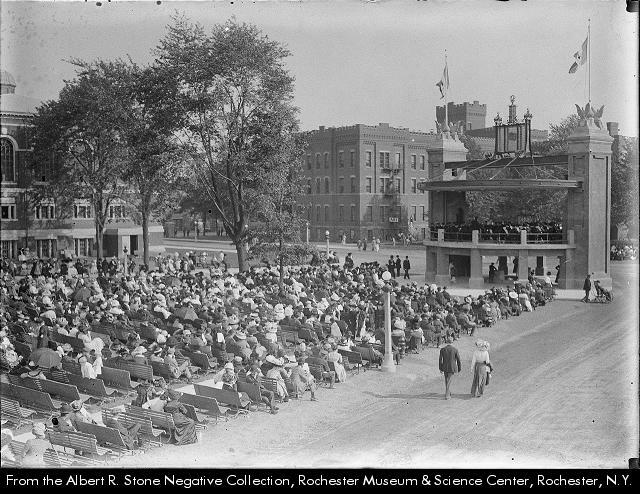 Just under 40 acres, this place has been home to juvenile delinquents, trade school students after the children’s prison was reformed in the late 1880s, hundreds of thousands of Rochesterians from across the entire city and region attending the annual Exposition from 1911 until the late 1940s, Glenn Miller and his orchestra, the 1950-51 NBA Champion Rochester Royals, high schoolers (Jefferson High School is a part of this site), model train buffs, and today neighbors and all kinds of recreators. It’s an amazing, complicated place. 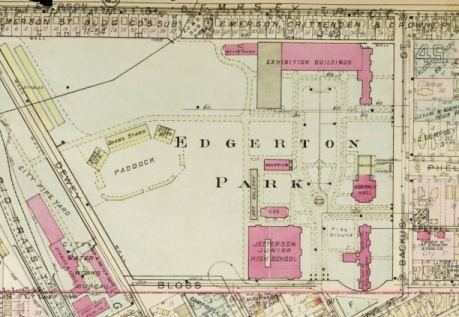 The map across time of Edgerton Park is really a guide to the changing life of our city. In the distance at the right is Jefferson High, and a bit to the left is the Edgerton Park Rec Center. And then: a running track, a children’s water park, tennis and basketball courts, and a whole bunch of ball fields. Sensing a rather large gap between what I could see and what I was beginning to sense were the other lives of this place, it was clearly time to investigate. Here we go. 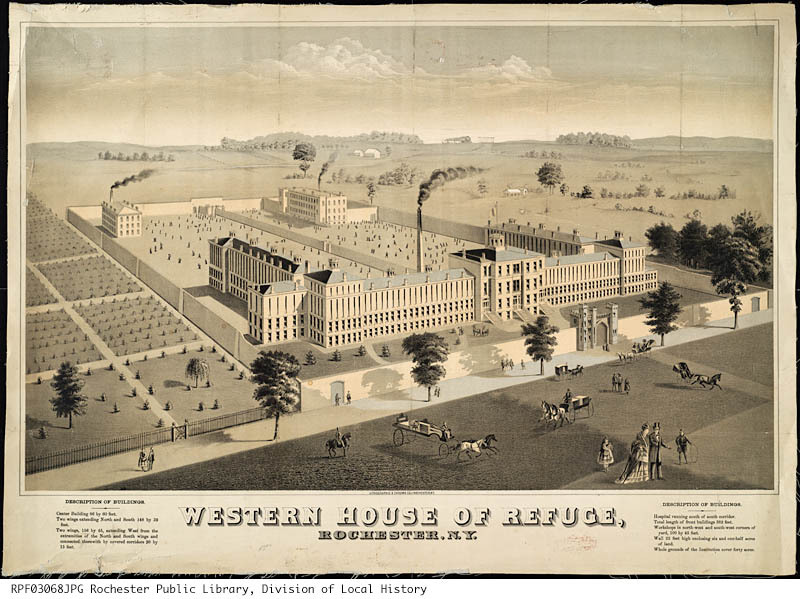 In 1846, the State of New York created the Western House of Refuge. 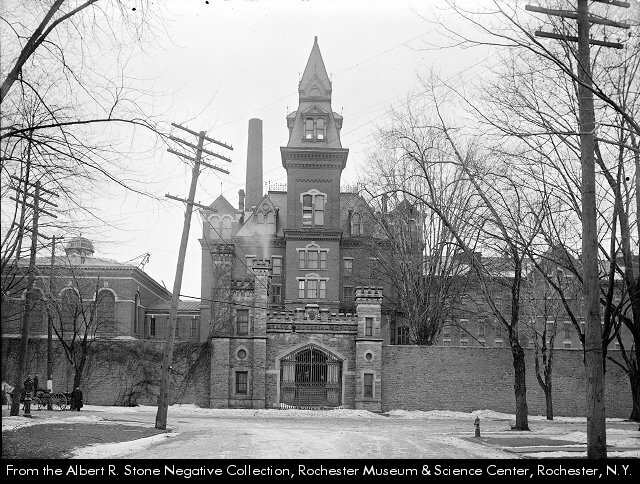 When complete, it was the first reform school in the United States – home to young delinquent boys. The place opened in 1849, with 50 children. 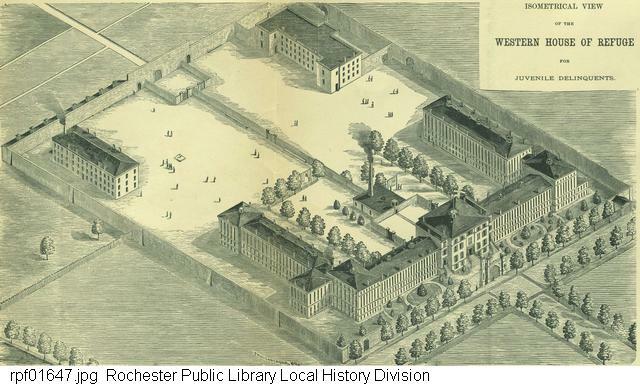 By 1875, the legislature agreed that girls could be housed here as well, and the place kept growing, with more and more buildings added to house the swelling roll of inmates. A walled prison in a bucolic, ex-urban setting. 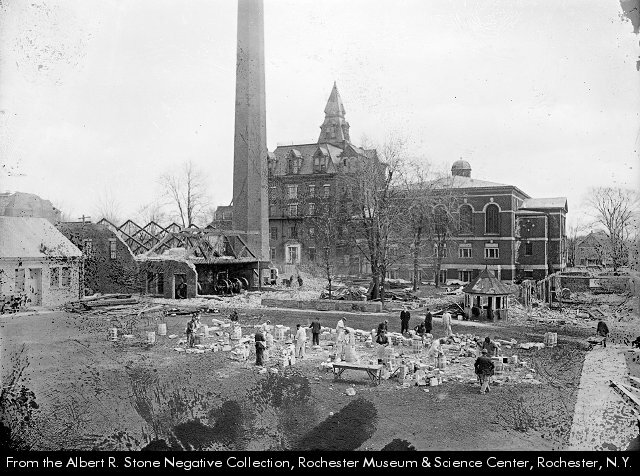 As the 19th century came to a close, reforming the reform school became an increasingly pressing matter. Corporal punishment was banned, hard labor reduced, bars on windows removed, real schooling instituted. In fact, by the late 1880s, the Western House of Refuge was renamed. It became the State Industrial School, and inmates were now taught trades in addition to their regular classes. That’s the Erie Canal running diagonally at the far left. 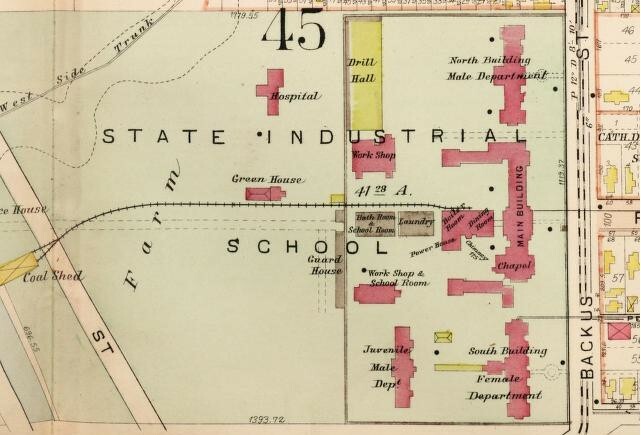 The School had a tiny railroad that carried supplies (mostly coal) from the Canal to the building that housed the boilers, the dining hall and the power house. And as you can begin to see, the city had moved out to and now surrounded the School. Time for change. 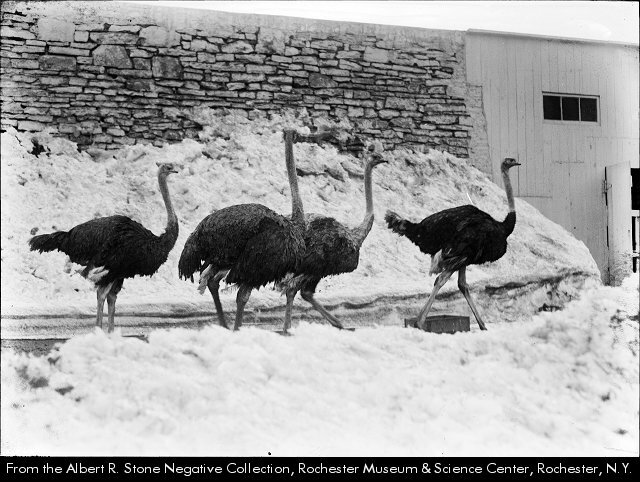 In 1902 the State purchased 1,000 acres of land in what was then the nearby but very rural Rush, New York, and the move began. By 1907, the site was abandoned. Now what? 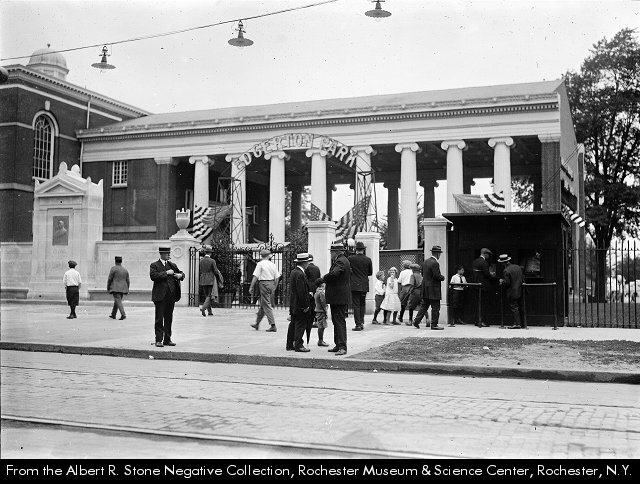 The City of Rochester bought the place, and transformed it into Exposition Park, home to what had begun as the Industrial Exposition Parade. Voila – now I was getting somewhere. But before Exposition Park would open, a certain canny photographer visited the place to show us what it looked like as a reform school. 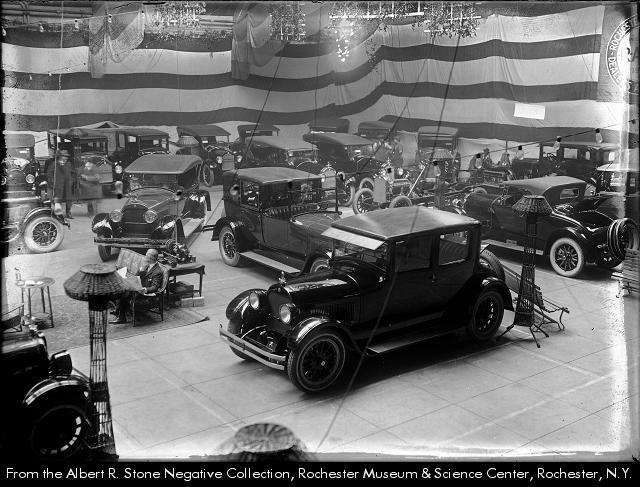 Here are a few of the images Mr. Stone shared with us. This is the Main Building and the main entrance to the School, facing east and Backus Street (Backus was an early Director of the Western House of Refuge). Mr. Stone took this image from the middle of Phelps Avenue. The portion on the left, with the arched openings, is the chapel. Remember that part of this huge rambling building – you’ll need it later. Demolition is underway – the boiler room/power house/dining hall is biting the dust in the middle ground. In the distance is the Main Building, and again the chapel is seen on the right. You’re looking east. Looking north, towards the School. Streetcar tracks. In both directions. Remember this – it will become very important later. Very important. So, with demolition complete, Exposition Park could open. 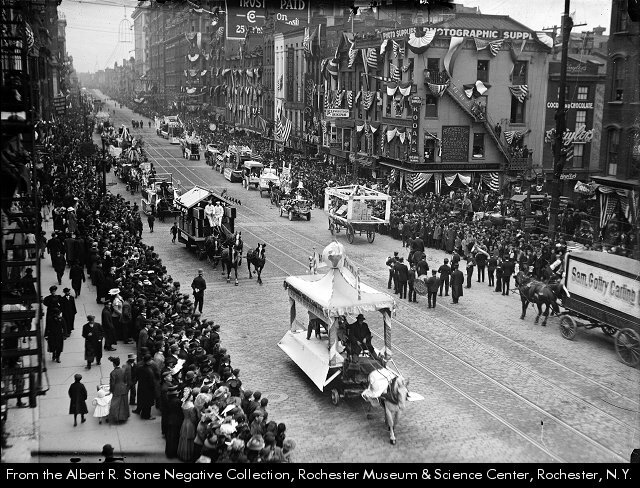 From the looks of the parade in 1908, I expected to find that this annual event would prove to be some kind of glorified trade show. Boy, was I wrong. I think the bandstand is one of the odder structures I have seen. 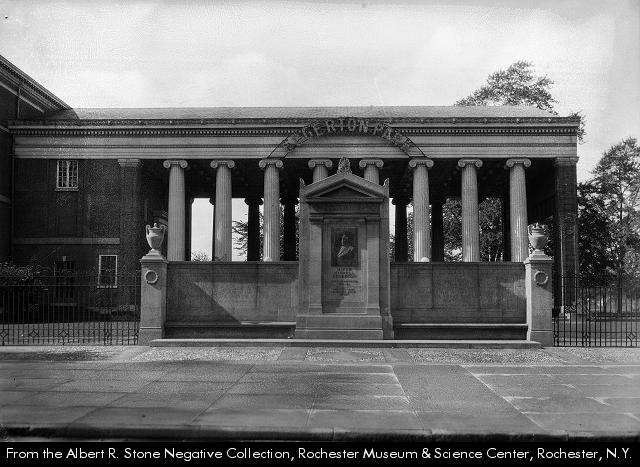 Here’s another view, from 1922. To the left of the bandstand is the zoo, complete with apes and bears and ostriches. 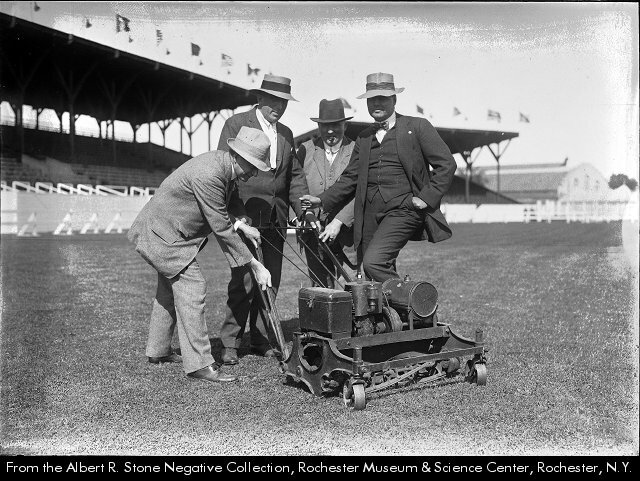 Yes, that’s a lawnmower – 1920. 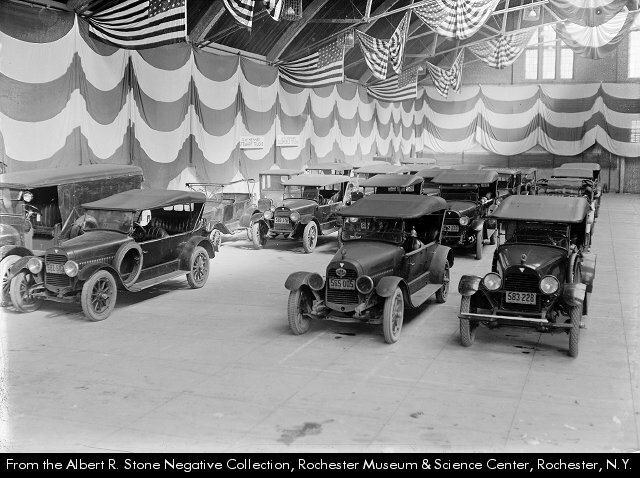 This is an exhibition of stolen autos, held in 1920. The cars were stolen in the midwest, but shown here. Hmm. 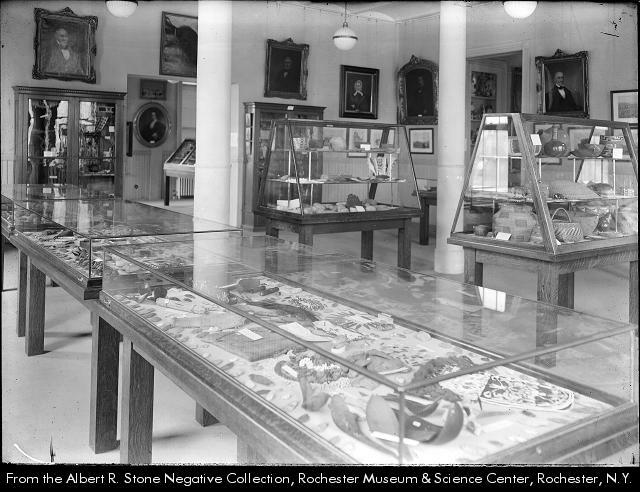 An exhibition of “Fruit Diseases and Injurious Insects,” 1921. Huge crowds were the norm. Here are two views. Often these events were at the 4th of July, or revolved around patriotic events linked to World War I.
I could go on, and on, and on. Clearly this place was at the heart of city life in those days. Folks could hop on a streetcar, or later the subway, and then walk a block and join the throngs. 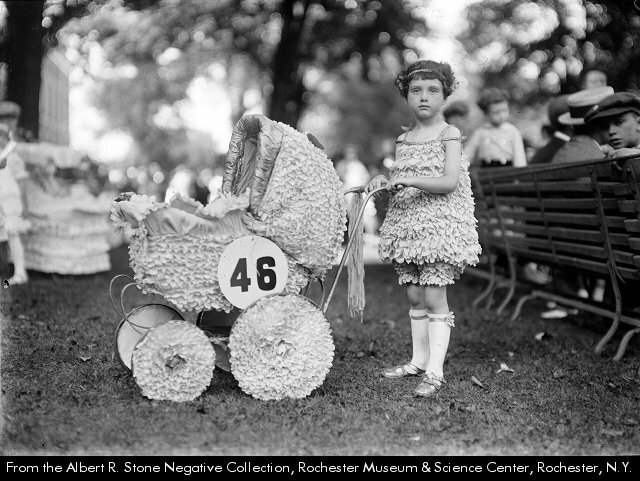 It must have been an amazing place – a kind of annual mini-World’s Fair. The more I looked, the more astonished I became at the heady life of this place. 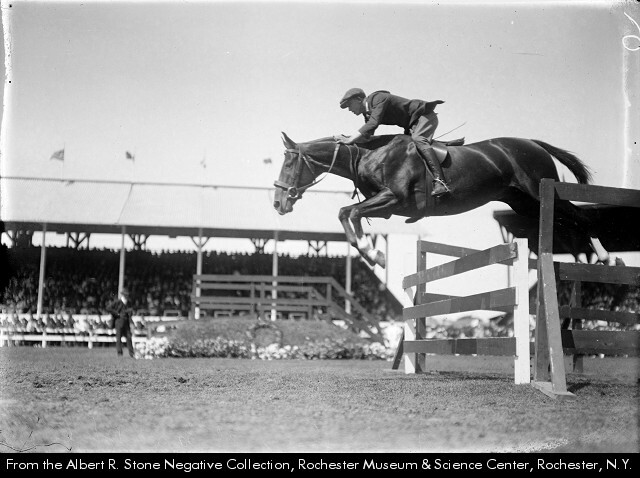 Here’s Edgerton Park in 1926. By then, Mayor Edgerton was gone, and the place had taken his name. Notice that the Erie Canal is gone now, and in its place, at the far left, is the word “Transit.” This was our beloved subway. You could get to Expo Park by subway, or by streetcar on one of at least two car lines. Kodak Park was only a few blocks south, and this part of the city was dense and bustling. It’s on the left, in front of the peristyle where visitors bought their tickets. I have not been able to figure out what happened to the monument – it’s gone, but I don’t know where. Maybe you know. Back to the Expo. 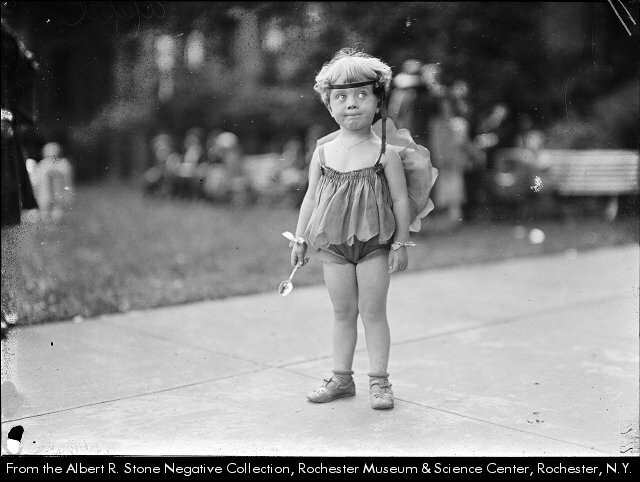 Every year one of the most wonderful features was the baby contest. 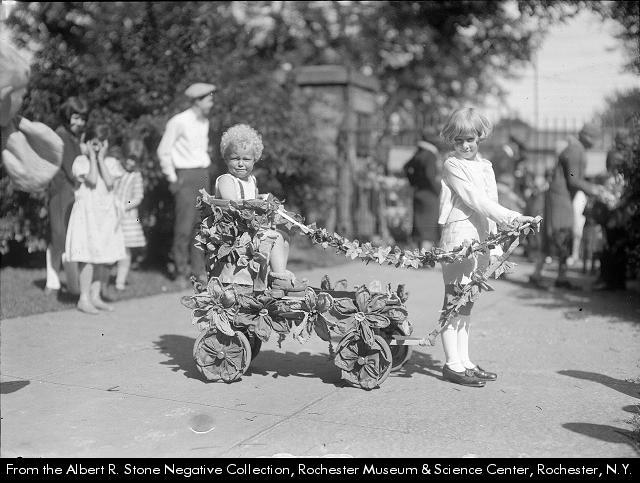 That’s Richard Eyer and Doris Sedgwick, in 1926. Virginia Grace Coxon, in 1923. The Expo survived the Depression, and went strong until the 1940s. But it faded after World War II, and I couldn’t figure out what happened, or why. I knew that hockey was played in the old arena in the late 40s and 50s. I knew that the Royals (now the Sacramento Kings) won the NBA championship here in game seven of the 1950-51 season. I knew that the PAL (Police athletic League) started a fabulous model train layout in the 50s, aimed at giving children something creative to do, and which thankfully survives. But I could not figure out how the place went from being at the heart of the city to being a big neighborhood park. Today, a few more views. 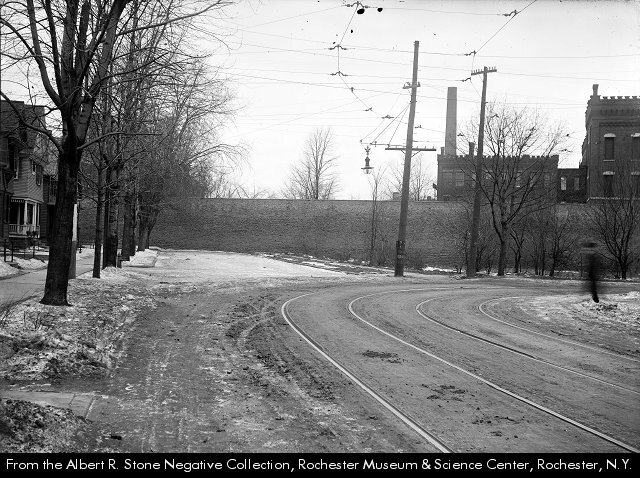 First, a view of the park in almost the same place as Mr. Stone’s image of 1910 – the middle of Phelps Avenue looking west at the chapel. Remember the chapel? Good. There it is – the Edgerton Park Rec Center. 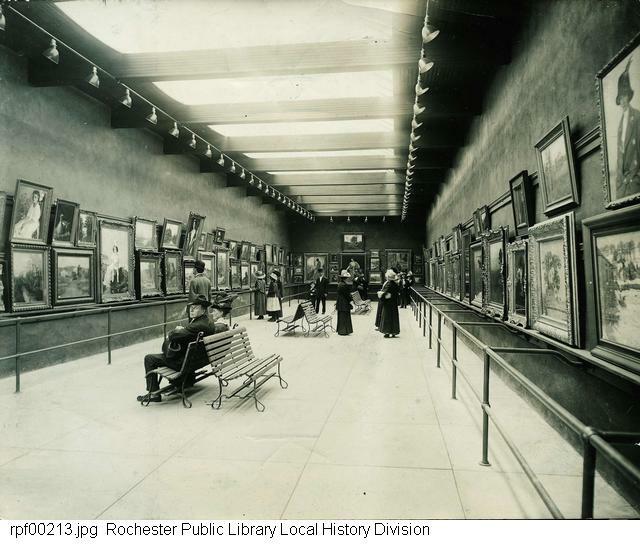 Rochester Subway, and today a berm. And here, another view of the park today. Today, the park is an important part of the neighborhood. A few events at the park draw folks from across the city – dances, the model trains, athletic contests, the water park, and others. And the city is conducting a few special events in this, Expo/Edgerton Park’s centennial year. But as the city dispersed after World War II, and Kodak dwindled, and the car took over the streets, the park went from central to the life of the city to peripheral, at best. It’s this last part that I could not figure out. What was it that pulled the plug on this place? Dances and concerts continued into the 50s. Glenn Miller – yikes. Basketball – big time. Hmm. And then last week, the last piece of the puzzle emerged. We had lunch with some of Amy’s long time family friends, from her old neighborhood. She baby-sat for the family, and the matriarch of the family, an M.D., grew up in the Edgerton neighborhood. She remembered the Expo, and the concerts and the music. She remembered the dances especially, jitterbugging into the night. She said: “Things were different after the War (World War II).” And then the light went on, at last. The city pulled out the streetcars in 1941. 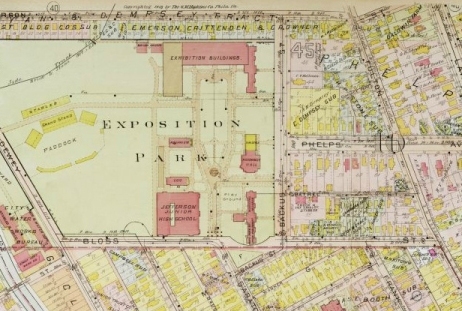 Symptomatically, Expo Park ceased in 1947. And the subway ceased in 1956. In 1957 the former World Champion NBA Rochester Royals moved to Cincinnati, and thence to Sacramento. Our lives changed radically here in the late 1940s and into the 1950s, like lives in cities across the nation. Edgerton Park, so long a central part of the life of the city, was now abandoned, and marooned. The river of city life had shifted, and today the map shows only a small creek where once had been a mighty stream. Chapter closed. Today Edgerton Park remains an important place in our city. While the neighborhood is poorer than the old days, and abandoned buildings are visible, it would be wrong to underestimate the role the place continues to play in the life of the city. But there are no more throngs, no monuments to beloved mayors, no baby contests, no exhibitions. The city does not teem to the park on the 4th of July. It’s pretty quiet now. 165 years in the life of any city is a long time. Edgerton Park has unfolded before my eyes, from prison to school to gathering place to home for great city moments, and now, simply, a park. Perhaps we made some mistakes along the way. The future’s map is unclear. But certainly we will not go back to where we have been. 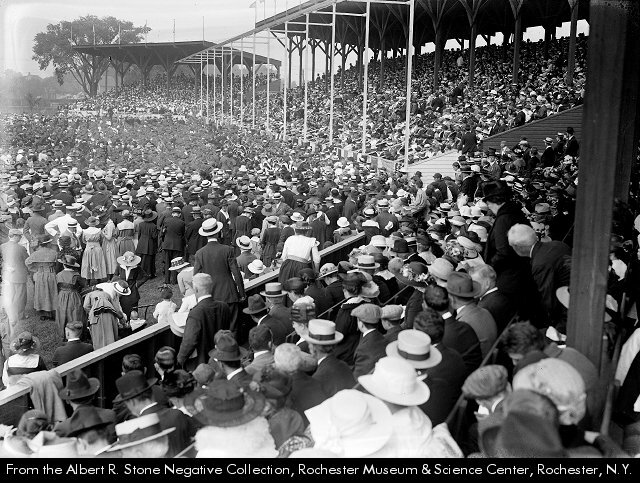 Question: how did most Rochesterians get to the ballyard in 1910? Answer: simply ask Mr. Stone (somehow, I missed this one). 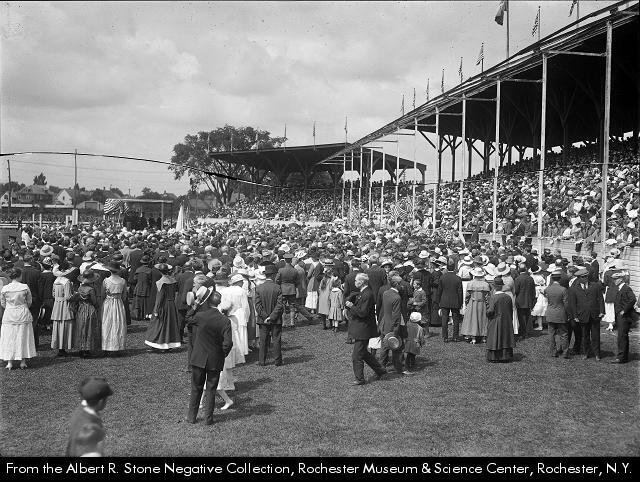 Opening day, 1910. 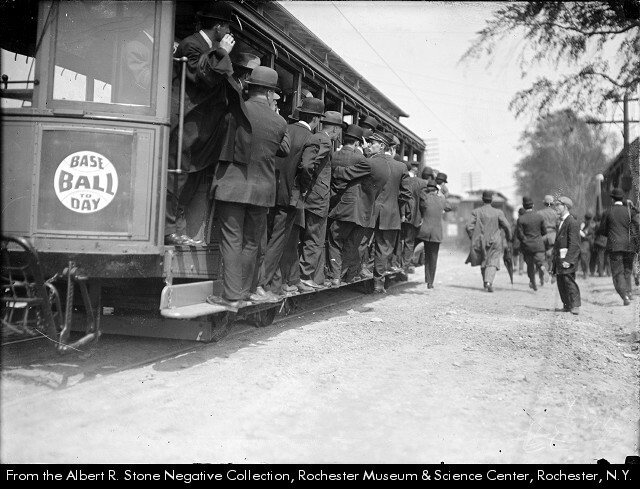 Until Bay and Webster no longer hosted Rochester’s baseball (the last year there was 1928), the streetcar was your best transportation choice. Now take a look at this map (I feel like I have finally found the mother lode with the discovery of this extraordinary document) to see that you simply hop on the No. 6 car and you’re at the park. Discovering this map has helped me to solve some really knotty urban problems. Stay tuned – much more to come very soon.